There have traditionally been gay performers in classical music, musical theater, dance music, and sometimes pop music (though usually in the closet), but until Pansy Division came along, there had never been an out gay rock band. Raised on a diet of 60s and 70s rock, Pansy Division formed to play the styles of music they grew up with. Though not traditionally considered “gay” music, the members of Pansy Division took this form and shook it up, adding barbed, humorous lyrics, and an out of the closet, in-your-face approach. 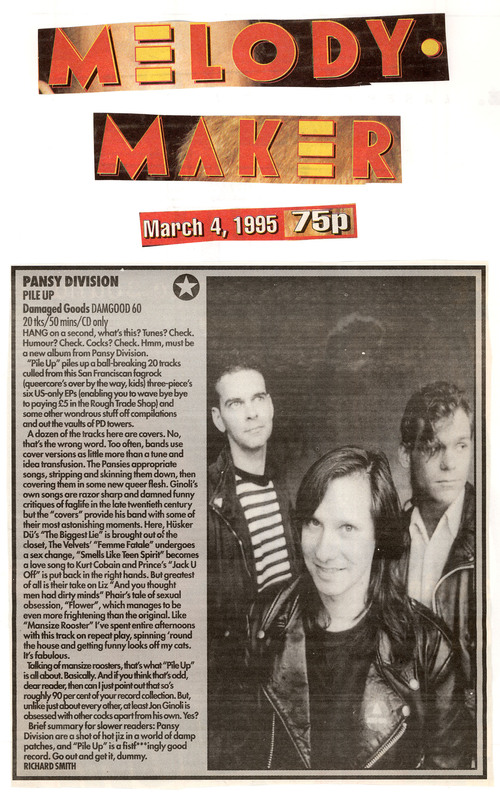 Pansy Division had its beginnings in San Francisco in the early 1990s. Guitarist/vocalist Jon Ginoli started the band in 1991 with a batch of songs and an idea about a band he’d dreamed of but had never heard. Bassist/vocalist Chris Freeman quickly joined, and together they formed the nucleus of the band. After a series of drummers, Luis joined the lineup at the end of 1996, and guitarist Patrick Goodwin was added in spring 1997. 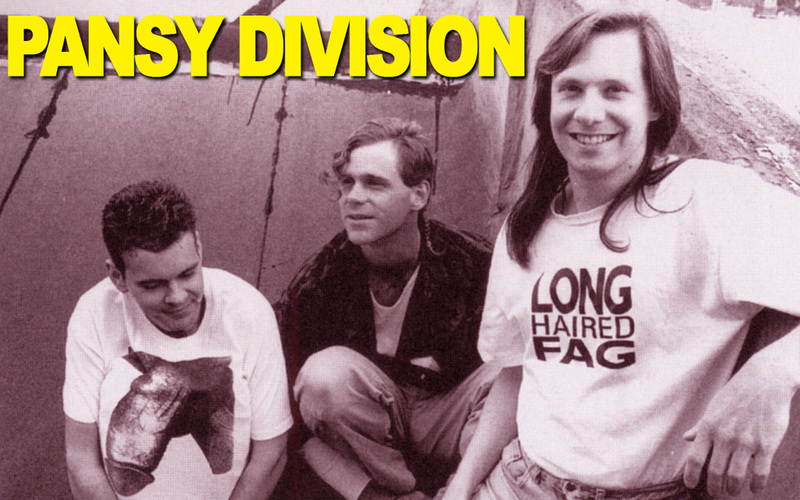 Significantly, both Luis and Patrick were already Pansy Division fans who had met the band at their shows, and when recruited, jumped at the chance to join. From the beginning – their first 45 in 1992 and first album in 1993 – Pansy Division has attracted interest and curiosity. Though on an independent label (Lookout Records), they continue to amass a growing and diverse grassroots following. They did their first tour in 1993, and in 1994 spent two months touring with Green Day, playing arenas (culminating with a gig at Madison Square Garden) and exposing them to a mass audience. They’ve been busy ever since, crisscrossing the US and Canada numerous times, as well as two European tours and visits to Australia and New Zealand. Their most recent album, Absurd Pop Song Romance, is their first recording as a quartet. A major leap in the band’s development, it launches what is really their second career. Recorded with famed engineer Steve Albini (who has worked with Nirvana, Bush, PJ Harvey, and many others) at his studio in Chicago, it’s a more serious in mood. The sound is now fuller, richer, darker, simultaneously more rock and more pop, and more beautiful than in the past. After making six albums in six years, Pansy Division has recently maintained a less hectic schedule. They are currently working on new songs for their next album (due in 2002), and making occasional live appearances.